Getting to Vientiane by bus from Bangkok via the Nong Khia-Piyaw border crossing is really easy. I booked our bus online via 12ToGo. Confirmation was immediate. I printed out the voucher and presentrd it to counter 30 at the 3rd floor of the Bangkok (Chatuchak) Station (formerly called the Mo Chit Station). I got my 6 tickets and we headed down to the first floor to board the bus at platform 5. The bus run by Budsarakam Tours was a really with seats that almost fully reclined. Seating arrangement was 1 seat-aisle-2 seats which made for wide seats and spacious leg room. Each seat came equipped with an electric back massage and an lcd screen. Really cool. We were given a cold bottle of water, a small carton of chocolate milk, and a small cake. I managed to grab the entire lower deck of the bus which sat 6 people, our exact number. It felt like having our very own cabin. We departed at 8:45pm . At the upper deck were about 10 passengers. The bus made 2 stops. At the first stop, showing your ticket to the food counter gives you a free steamed bun. 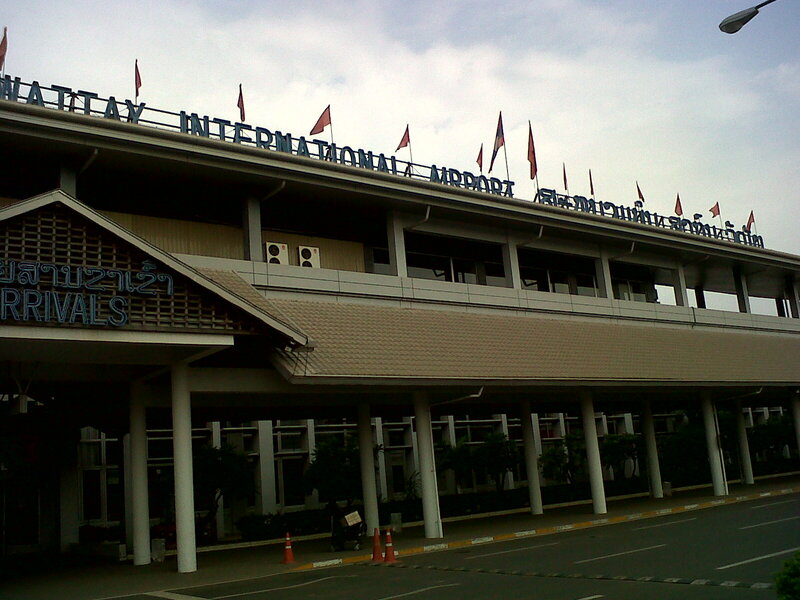 We arrived at the Nong Khai bus terminal at 6am. Exiting the bus, touts offetrd to bring us to the border by tuk tuk. The Lao border opens at 8am so there was no need to rush there. 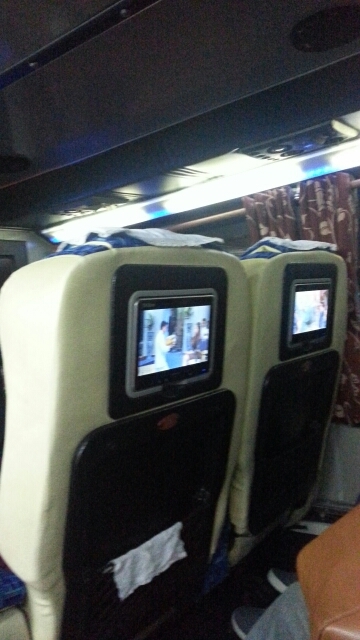 We bought tickets (THB 55) for the international bus to Vientiane. There were lots of locals so it was good to be there early to get seats. The bus left at 7:30 am. It was a bit traffic so we arrived at Thai immigrations close to 8am. We headed to Passport Control and for ourselves stamped out of Thailand. There were lots of people. So as soon you arrived, make a beeline to the counter. Past immigrations, we boarded the bus again. 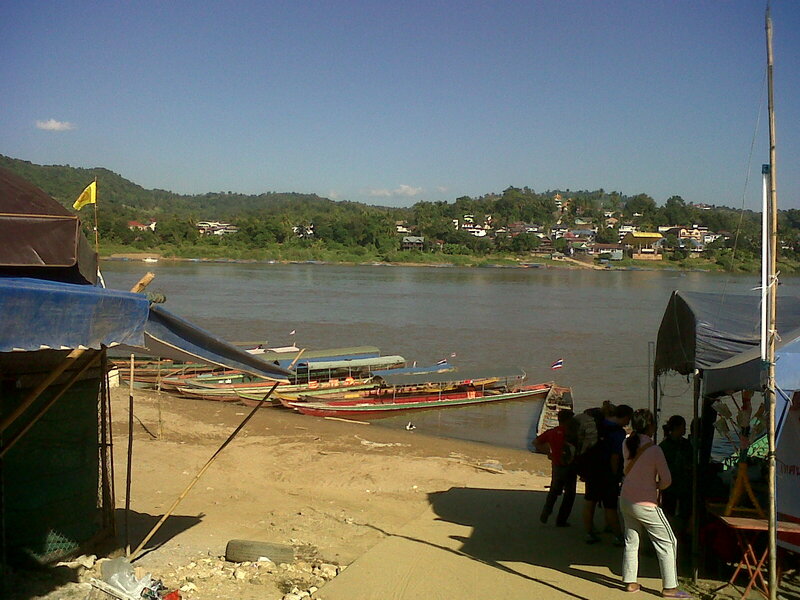 A few minutes later, we arrived at the Lao border. We filled-out the Arrival Forms (get them at the counters) and passed through passport control. Since we were visa-free, we had to go get our RFID card pass at another counter outside immigrations. Gave our passports to the officer and paid THB 5. To exit, we simply put the card pass at the electronic gate and went through. Viola! We were officially in Laos. The trip from the border to the Vientiane bus station took almost an hour. 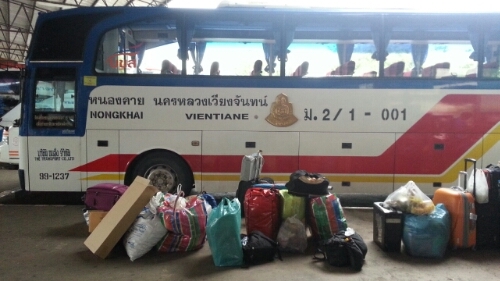 Arriving there, we hired a van for THB 300 to bring all six of us to Dong Deaun hotel near the river. 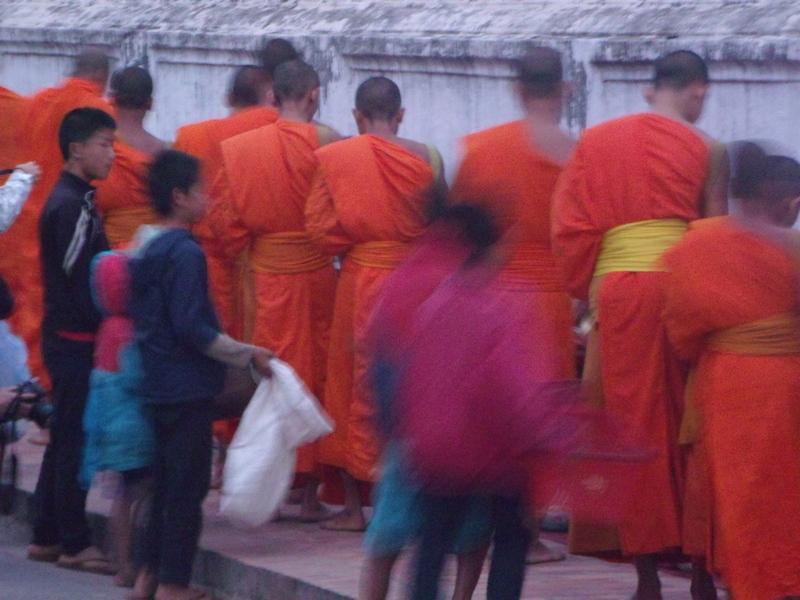 This is a long delayed post as I was in Luang Prabang first week of January. 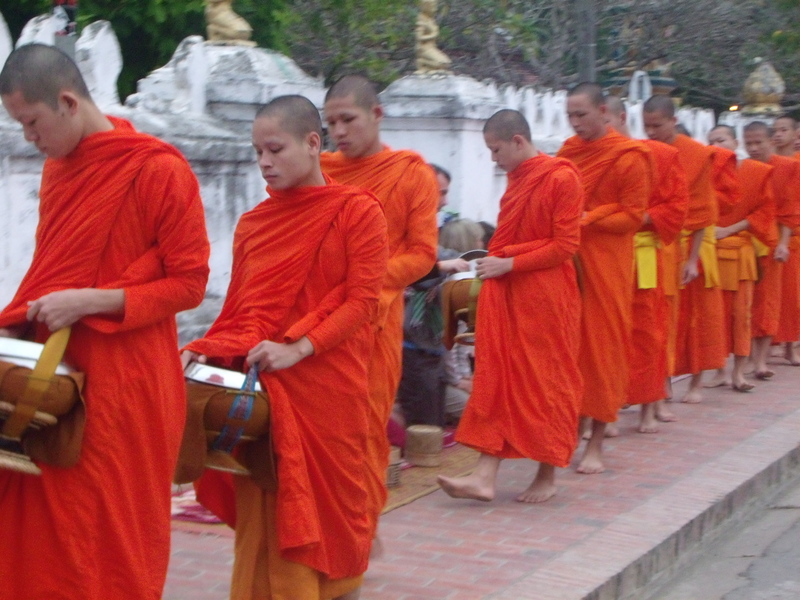 While doing a slide presentation for a workshop this coming weekend, I stumbled on my Laos travel pics and thumbing through the images brought magical memories of the alms ceremony in Luang Prabang. Much has been said about the rude manners of some tourists who think nothing of destroying the solemnity of the ceremony by jostling with the monks or taking part in the ceremony for photo opportunities. To those tourists, I wish that some naga would devour them. Below are a few interesting things about the ceremony. 1. It’s not as early as you think. 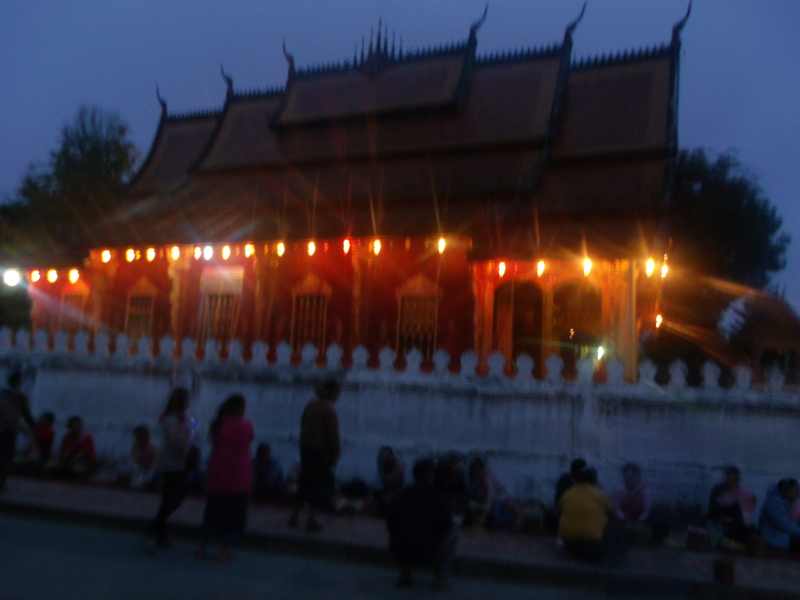 January is brrrrrrr season in Luang Prabang which meant that dawn wouldn’t be breaking out until about 5:30am. 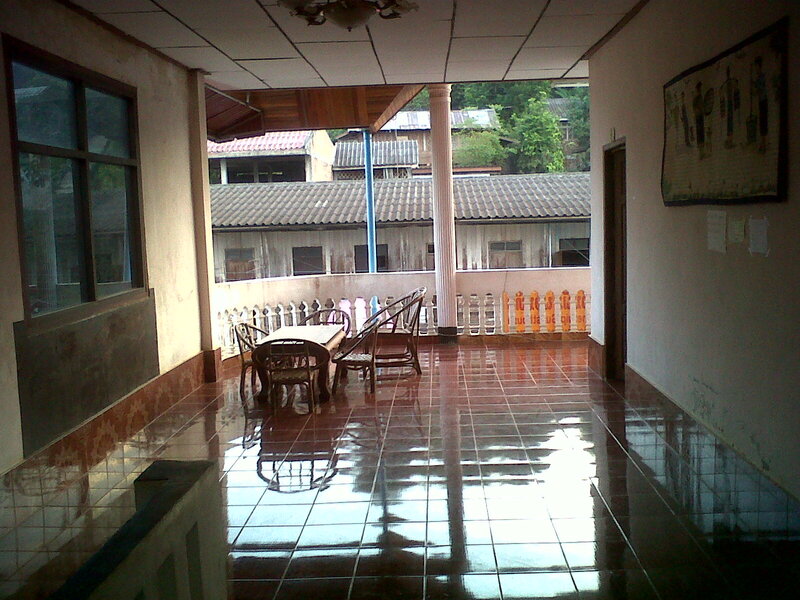 On my first morning at LP, I was up by 5am, peered through the door of my guesthouse, and saw black. Too early. 5:30 is just about the right time for enough light and for the locals and the hordes of tourists wanting to participate (mostly for sheer photo ops) to start setting-up their offerings. 3. Locals earn merit by it. Buddhism allows mortals to gain brownie points through certain acts. 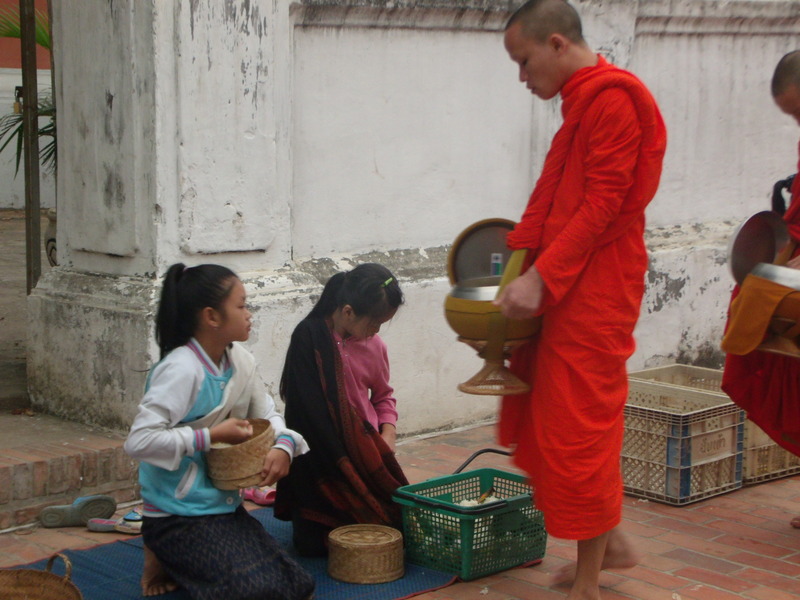 One of them is to make merit by offering food to monks. 4. The monks really do eat the food. This is their daily sustenance. A few years ago, the temples threatened to stop the ceremony as some monks were getting sick from the bad food being given (presumably by tourists). If you would want to participate, give good quality rice and other food stuff they might want. I saw some Asian tourists giving packaged food such as crackers. 5. Others get to eat too. 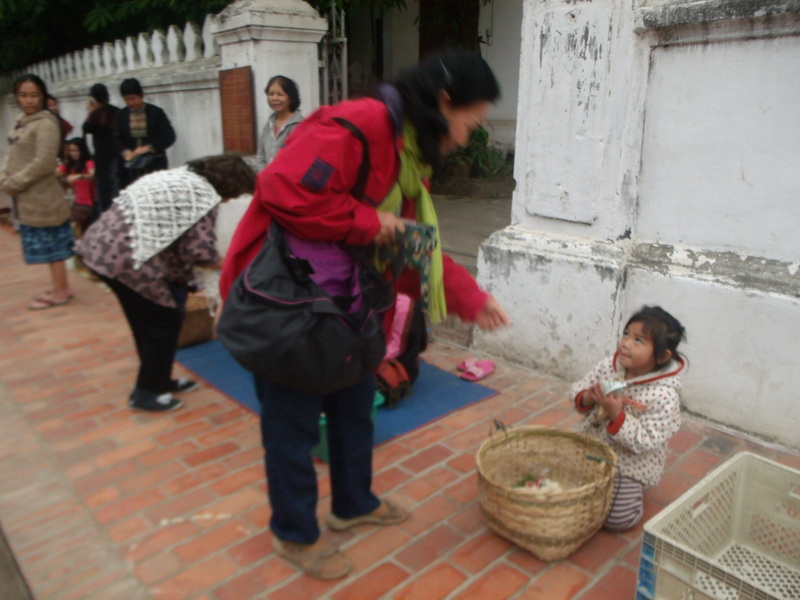 You will also see small children with baskets kneeling by the sidewalk. Others follow the monks from behind. 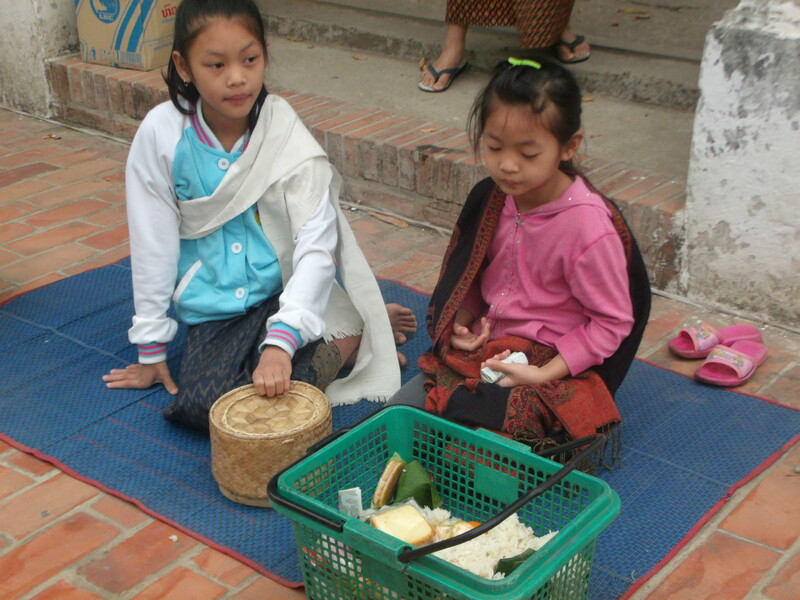 Some of the monks give their excess food to these children. A monk can just take too many rice balls in one day, right? 6. Feed the monks. Feed the children. If you have some extra food, you can give them to the children. Prohibited from seeing the ongoing party with government officials (Laos is socialist, remember?) 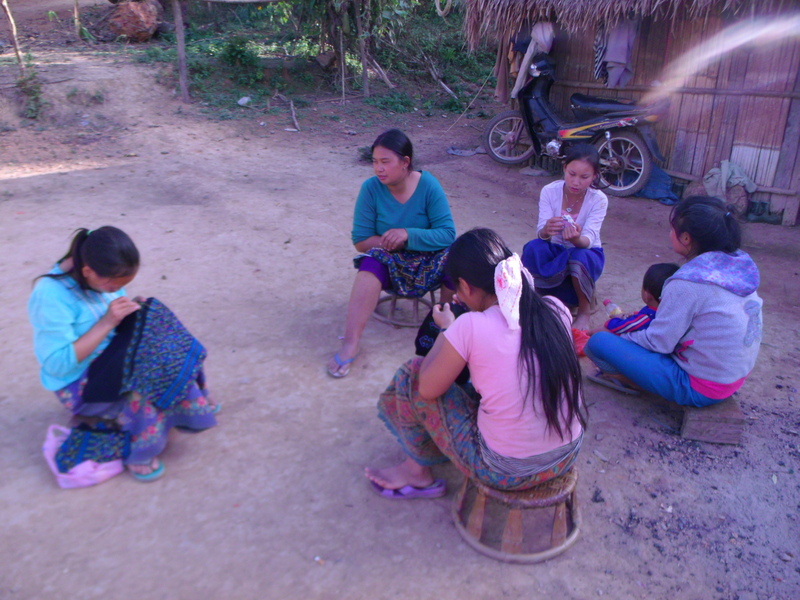 , we turned our attention to the two Yao women doing some embroidery. I sat on a woven stool beside one of them and asked Som to ask for permission to take her pic. “If you buy something, you can take her picture,” came the translated reply. In exchange for red and blue-colored hanging ornament that cost only 5,000k, I took pictures as much as I wanted to. Having rested our weary legs, we continued on the cemented road on the village to our lodging. On the way, we passed by a house with a death ceremony going on. I have been quite lucky with death ceremonies during my travels. In Bali, on the way to Sukawati, we passed by a house with a gamelan playing outside. Our car driver/guide explained that there was a funeral ceremony. He glady stopped so I could watch the procession from the house to the field across it where some incense was burned. 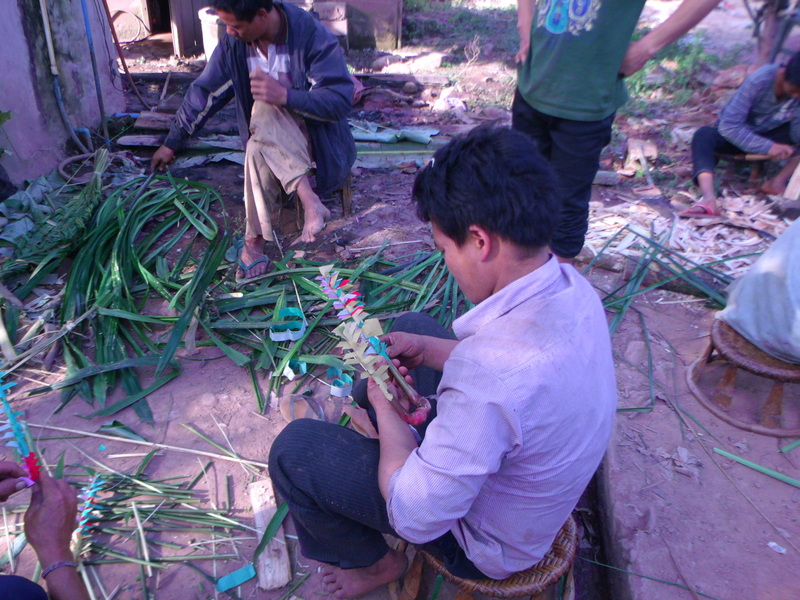 Hiking with a guide in Sapa, I also passed by a house in a H’mong village where a death ceremony was going-on. Unfortunately, the guide, a Vietnamese and not a H’mong, didn’t know the people in the house, so we couldn’t stay and watch. We entered the house compound which was crowded with people eating and drinking. Inside, an altar had been set-up along the wall of the house acorss the main door. Scrolls with printed images of Chinese dieties were hanging from a wall on the right side and on the wall behind the altar. Hangings made from colored-paper cut-outs dangled from one corner. A shaman (mong mo) was seated on a chair in front of the altar and chanted from a book written in Chinese calligraphy. The chant was plaintive and quite monotonous and sung in chest tones in medium register. In front of the altar, a young man was dressed in ceremonial Chinese dress of blue printed with large flowers. He had on white long-sleeved shirt on top of which was a tunic of red shiny cloth. On his head, he wore a red cap. His right hand held a small bronze bell which he rang rhythmically with the dance steps his feet made—-small, almost mincing marching steps on the same spot or at times moving to the side while his upper body swayed side to side. At times, he would bend his knees forward causing his upper body to stoop forward as he dropped his arms straight down nearly to the floor and moving in a fluid sweeping motion. Out of respect, I refrained from taking any pictures of videos but I could remember the scene in my mind’s eye as I was mesmerized with it. There was no other sound except the shaman’s voice and the bell. Sometimes, the shaman would stop chanting but the dancing man continued his movements. Just as I left from my post by the side door leading to the yard behind the house to join Som and Oleg, a middle-aged woman was setting some food on a typical Lao bamboo table. 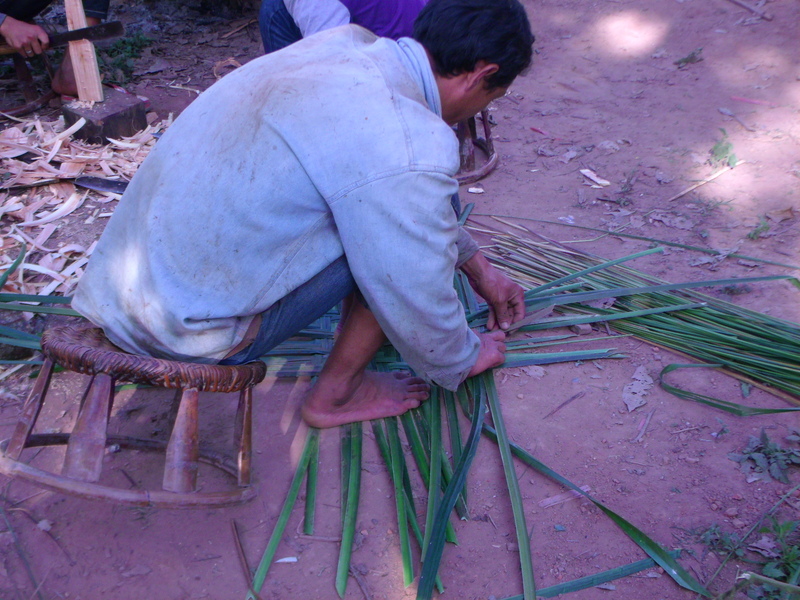 The scene and atmosphere outside was different as there were people drinking and eating and group of men who crafting some decorations from palm strips. Another one had just started to weave what must be a mat. This was post-burial celebration for a man who had died of fever at the age of 52. I would have wanted to stay longer and watch and observe some more but we had to make out way to another village where our lodging for the night was. We walked along the road,hanged a left and reached a small cluster of houses. A group of women were doing embroidery in front of one house while children played on the empty field around which a few houses were positioned around. Our accommodation was a purpose-built cottage with earthen floor, woven walls and ceiling. On one corner was the kitchen with its earthen stove. A simple wooden shelf held kitchen and eating and drinking utensils. A wall separated the sleeping quarters from the rest of the cottage. A long wooden elevated platform that run the entire length of the cottage was laid out with mattresses. 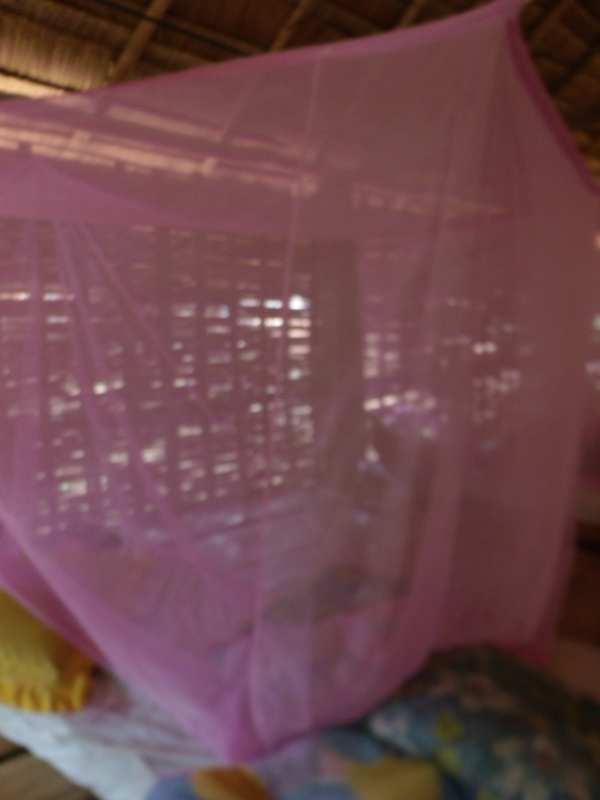 Individual mosquito nets hung from the ceiling. Each mattress was fitted with a sheet and we had a pillow and a thick comforter for the cold night. Simple but comfortable. My bed space under a mosquito net. It’s more comfortable than you think. An outhouse had a squat toilet and large plastic drums filled with water piped from a plastic hose connected to the village water source. 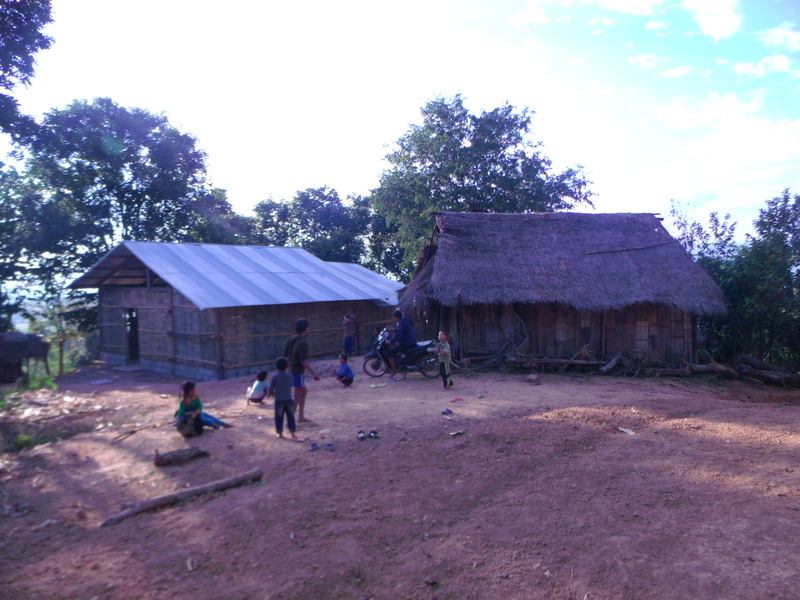 There was no electricity in this village except for one house which also had a refrigerator. Som told us that the hosting chores were rotated among the families in the village with the host receiving a gratuity of 70,000k per tourist plus expenses for the food and other stuff. Our host was a husband and wife team who seemed to be in their 40s. They had a shy little boy with them who played around with a cat. I had asked Som about some musical instruments and he promised to find someone who could play. He had earlier made arrangements for a shaman to come and talk with us. He was still in the house where there was a death celebration so I just decided to just take a nap while waiting for him. I woke-up mid-afternoon just in time for the arrival of the shaman. He was not at all what I imagined a shaman to be. For one, he was middle-aged and not old. He was dressed in red shirt and trousers. With Som as translator, we talked about his role in the village. He had been a shaman for 22 years already having come from a line of shamans on his father side. He didn’t learn his craft from his father though as he was not at all interested when he was young. It was only after getting married that he took serious interest in it and started learning from an old shaman. Currently, he has five people learning from him. Chants and prayers are in a Chinese language that the Chinese don’t understand. Perhaps it’s an older form of Chinese or a pidgin as the Yao settled in Laos from southern China hundreds of years ago. A middle-aged guy came in with a wooden trumpet called Phan ti it looked very similar to the Vietnamese, Thai, and Malay trumpets played in ensembles. The reed wasn’t very good so the musician and also the shaman had trouble playing it properly, much more, producing a really good sound with it. 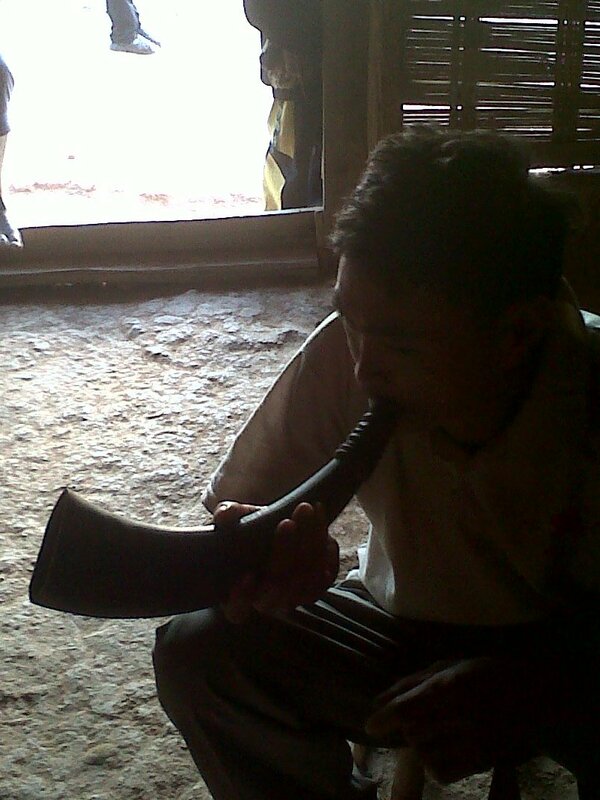 Another guy came in bringing with him a buffalo horn (Ngu Chong) which is played by shamans only. When someone is sick, the shaman blows the horn to call the chief of the spirits to come and help cure the person. Primarily used as an instrument to announce something to the spirit world, it is also played when someone dies. We took a short stroll around the small village while the host cooked our dinner. 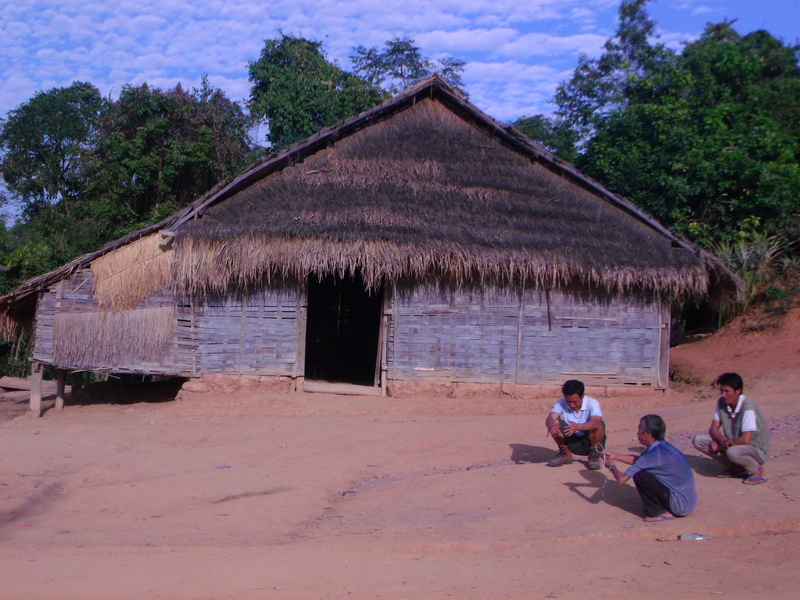 Unlike the earlier village, this one was more simple as there were only wooden houses. It was also very small consisting only of a few houses. Back at the cottage, we were treated to traditional Yao massage that was supposed to be given to guests. How traditional it was our how Yao it was, I have no idea. But I laid on my back while a women and her little daughter no older than 7 years, pressed on my legs, thighs, and arms with their hands. It felt quite good. Seated on a traditional round bamboo table found all over Laos, we had a dinner of sauteed cabbage, green pumpkin cooked in broth, grilled chicken, and steamed rice. The host family didn’t join us which was a shame as it could have been good to interact with them despite the language barrier. By the way, the chicken wasn’t a freshly-killed one. Rather, it came out of a package. Yup. Chicken breast fillet from a frozen grocery-bought package fresh from the freezer at the only house in the village with electricity. After dinner, five young women, beautiful in their traditional Yao dress with intricate embroidery danced to some modern Yao tunes played on a portable mp3 player. Nothing wrong with that. It’s the modern age. At least the music is Yao and not Lao. I’m not sure how traditional the dance steps are though. It was really really cold as I crept to my mattresses and snuggled in my comforter. Taking a bath was a real challenge as the temperature had really dropped and the water was freezing. The next morning, I woke-up quite early and headed straight to the outhouse. I had woken-up really early in the morning. Dawn had yet to break and it was freezing cold but I really had to pee. Having forgotten to bring my torch, I had to rely on the weak light of my mobile phone. I couldn’t open the door that led to the outhouse so I tried the main door and somehow figured how to open it (a wooden pole was set against it). It was too dark so I just peed a few steps from the main door. I had been hearing some drumming and asked Som about it. Our host said it was coming from the house where there was a death celebration. Unfortunately, by the time we were ready to go, the drumming had stopped. In the middle of a breakfast of omelette and bread, a woman came in. She had brought the head wrap I had requested! 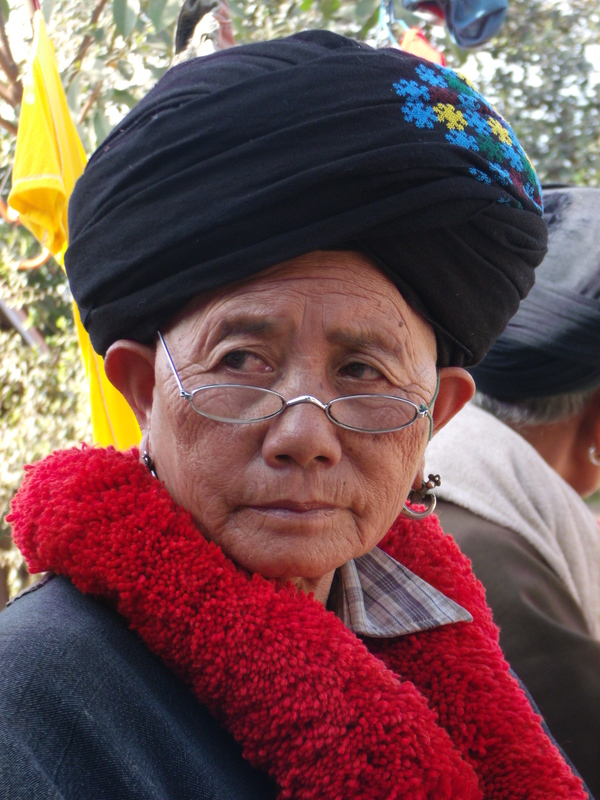 The Yao are known for their fine back-to-back embroidery and the head wrap had some really nice patterns on its edges. She showed me how it’s wrapped. We packed our bags and our lunch which the hosts had cooked and headed to the final leg of our hike. 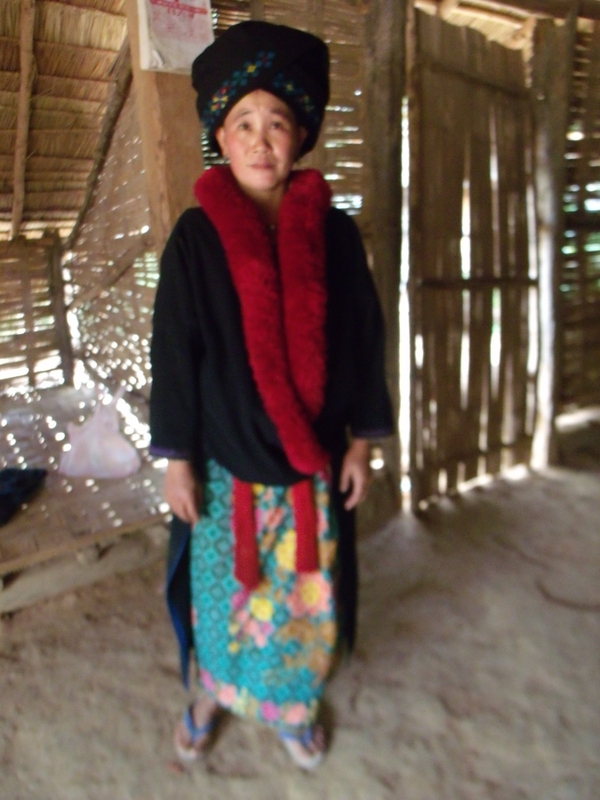 We had decided on a longer trail that would take use to several Akha villages. This post on my 3-week vacation in Laos from the last week of December to the second week of January this year is almost a month late. Out first was my post on how I missed my flight from Vientiane to KL which was written and posted immediately from the internet cafe across my guesthouse near the riverside at Vientiane having come back from the airport. 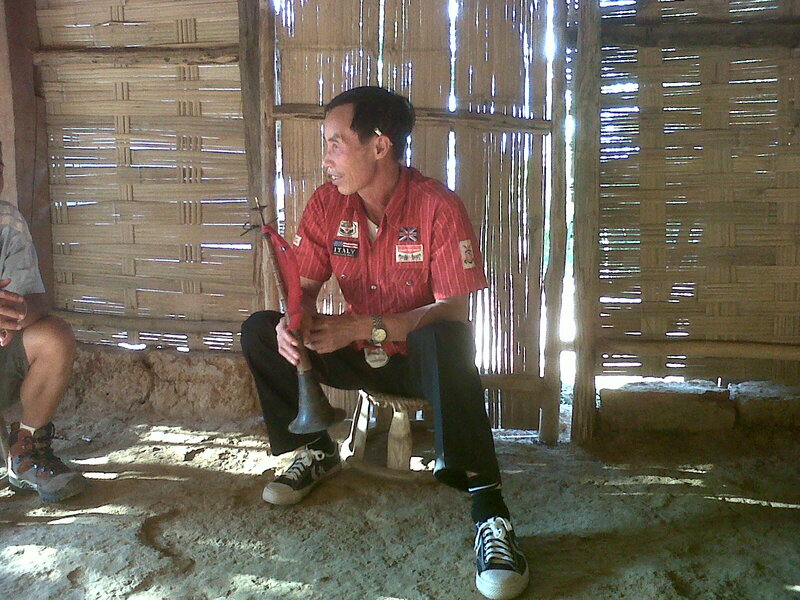 In Laos, I had learned to turn the art of doing nothing into a true masterpiece. But before all of that, was some bit of stress. My flight from Clark to Bangkok was still at 6:10pm but I had no choice but to take the 12:00nn Philtranco shuttle at Megamall as the next one would be at3:30p, too late for me. bus.Traffic had built-up and flagging a cab seemed to be hopeless. Fortunately, one came rattling along. I flung the doors open but when the driver heard my destination, he refused. For the first-time ever, I begged. I begged him to take me to Megamall and be there before 12:00 so I can catch the shuttle. I begged him to take me for Php 200. He upped it to Php 250. I sealed the deal. utes to 12. And he did. There was a bit of a crowd at waiting at the wooden benches at the Philtranco terminal. The shuttle was late, arriving close to 12:30 pm already. It was the turn of those who had 4pm flights to get anxious. I skipped the reserved seat I had booked in advanced and headed to the back of the row for some peace and quiet away from the nagging kid beside me. North-bound traffic was quite light and we arrived at Clark airport around 2:30 pm. There was nothing to do but wait for the counters to open at 4pm. It was the longest wait ever and a crappy one at that. There were lots of departing and arriving passengers. I meant to while away my time with some snacks at the food court outside but it was crowded and the tables were dirty. I spent the rest of the afternoon staring at the check-in counters. 4:00pm and I’m finally able to check-in leaving behind a group of chatty matrons on the next line who were kinda uppity that their line hadn’t started to move yet. At immigrations, I stood in line to be accosted (yup, that’s the right term for this kinda of officer) by a loud-mouthed immigration officer who had just sent a guy for a secondary interview at the office with a loud, “I’m sorry!” said in a manner befitting a cartoon character more than an officer of the Republic . To the lady ahead of me, he was asking the usual questions about work and how many days of travel, etc but in a totally repulsive manner that spoke of power-tripping. She and the guy on the other line, who it seemed was her boyfriend, were sent for secondary interview. When my turn came, I simply handed him my documents. Seeing my occupation, he suddenly turned all respectful. I answered his questions stoically. He stamped my passport and let me go. Compared to immigration officers at departure points in other countries, this guy was behaving in such a shameful manner. Due to late turn-around of aircraft, we departed close to 8pm, an almost 2 hour delay. I didn’t mind as that would mean less time spent wandering around Suvarnabhumi airport, my sleeping quarters for that evening. The flight was smooth and pleasant and I managed a few winks. 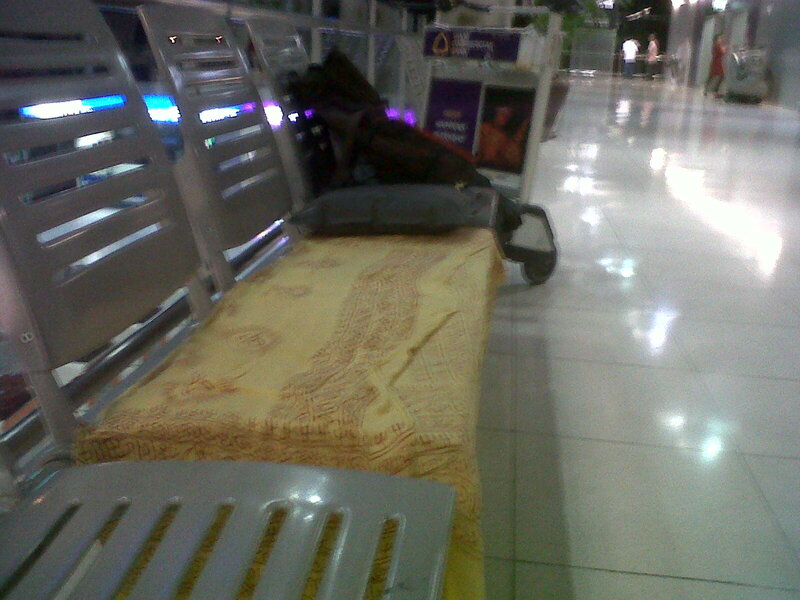 Suvarnabhumi is probably one of the best airports to sleep-in. It’s huge so there’s enough floor space for everyone. After a quick dinner at a Thai restaurant, I headed to chosen spot—- an entire row of empty steel seats at the third floor concourse near the toilets. I clamped my bag with my bike lock and slept. It was really cold and the thin sheet I had with me didn’t help much. I kept waking-up every hour. I finally stood-up around 5 am, drank my cereal, and headed to Gate 3 for the 6 am free shuttle to Don Meuang. There weren’t too many passengers and the traffic was light. The trip only took 50 minutes. After checking-in for my Air Asia flight, I had a quick breakfast at KFC. Their breakfast set was different from what we have back home— there was breakfast twister and biscuits which I absolutely loved! Across it was a Krispy Kreme stall but I resisted the temptation of trying it if it were any different from the one at home. 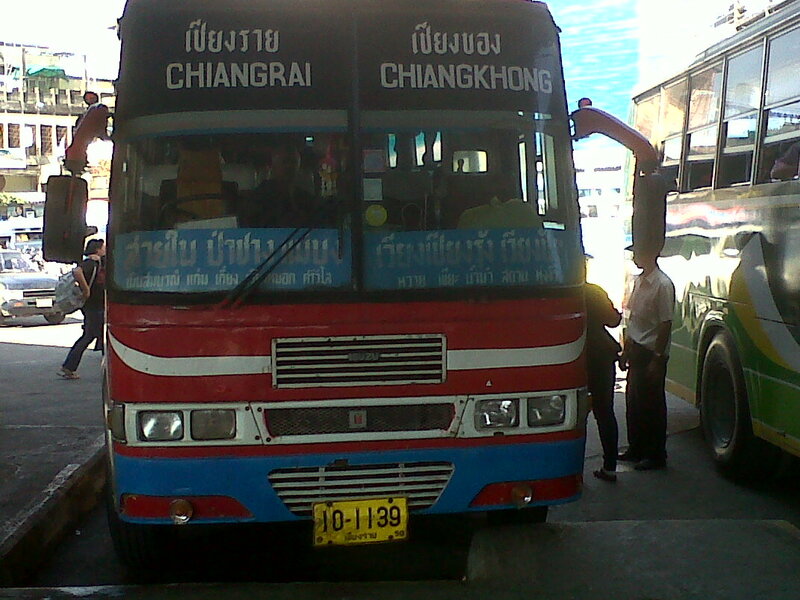 The flight departed on time and we landed at Chang Rai where I took a cab from the airport to the old bus station. It was easy to spot the right bus as there were big signboards and a helpful bus tout. One was leaving in a few minutes but I decided to take the 12nn one so I could grab a better seat and have a light lunch. The lady who pointed-out the bust to me put my big bag was at the rear. I put my blanket and fleece jacket on a window seat to reserve my spot beofre heading to one of the stalls selling sausages. Deliciously meaty. It would be my only taste of Isan cuisine. The bus departed on time and it as quite full by the time I took my seat. It was an ordinary local bus — no ai-rconditioning and with leg room good enough for people 5 feet and below. The trip to Chang Kong was on a good sealed road that passed through rice fields and villages. It was an unremarkable trip and I was glad to arrive at the small terminal after 2 hours where I took a tuk tuk for the 5-minute ride to the border and the boat dock. 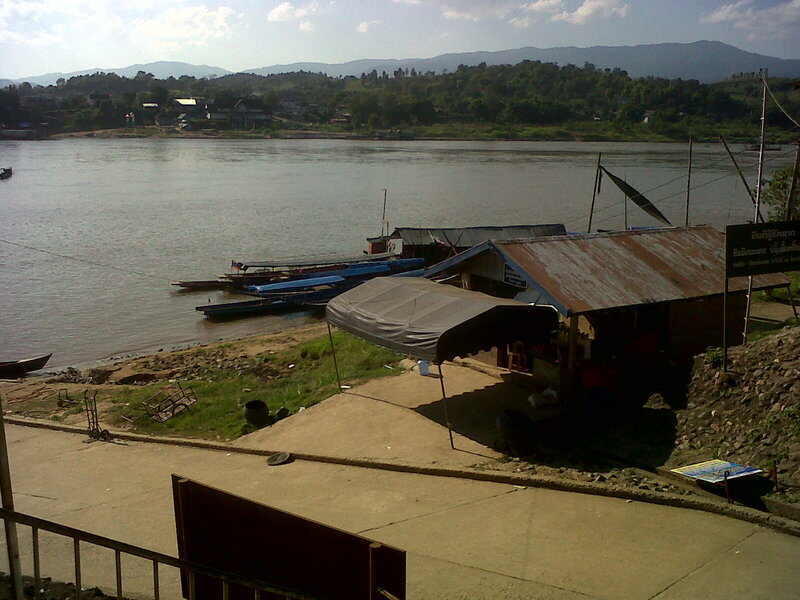 I had my passport stamped-out of Thailand, paid for the cross-river boat that took me and a few other passengers across the Mekong to Huay Xai and I was in Laos, albeit not officially as I yet had to pass through immigrations. That’s Huay Xai on the other side. At the small immigrations office, the officer looked quizzically at my passport turning the pages looking for my visa. I told him, “Philippines. No visa.” He turned to an officer beside him and I head him say, “Philippines.” They spoke a few seconds in Lao then he stamped my passport and handed it back to me together with my departure card. “10 baht,” he said. Without a flinch, I gave him the money which he put inside his drawer. Whatever it was for, I didn’t bother to ask. It was a small price to pay to get past a system that was known to charge fees for anything, especially from white-skinned travelers. Across it was a small money changer where I exchanged some dollars to kip. At the top of the road, on the main street, I took the room at the first guesthouse I came to, Phonetip, which I assumed to be a good one as it came recommended at the Thorn Tree Forum. 50,000 kip gave me decently-sized room with television, a comfortable bed, a bottle of water, an ensuite bathroom, and a view of the street below from a common terrace. Where’s My Flight? Or An Extra Day in Vientiane. 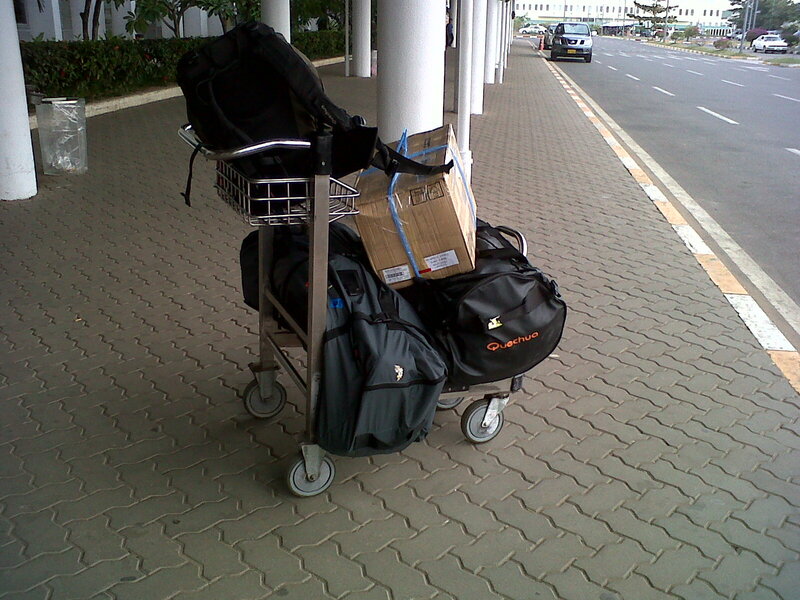 Everything had been packed and weighed carefully so as not to exceed my 25k pre-bought luggage allowance. I had checked-in online for a couple of days ago for my Vientane-KL and KL-Clark flights. I didn’t bother printing the Boarding Pass anymore as I knew they would print-out a new one at the check-in counter at Wattai International Airport. Put all my stuff at the tuk-tuk I had rented-out from in front of Mixay Guesthouse and headed to the airport. With the minimal traffic on Vientiane’s roads, we were there in less than 30 minutes. It was the most peaceful and serene airport I had ever seen. No cars, vans or transport of any kind lining up, no passengers! It was just me on the curb. The helpful tuk-tuk driver loaded my luggage on the trolley and I handed him 50,000k— keep the 10,000 change. 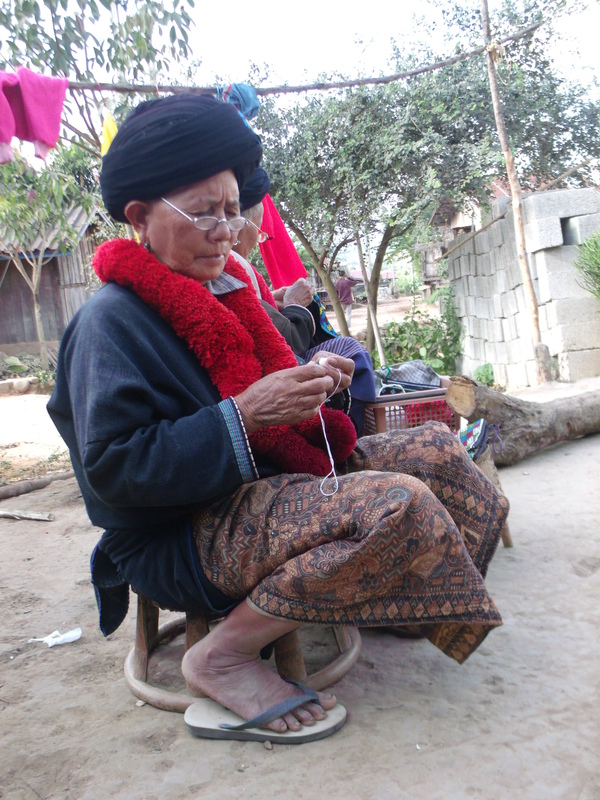 In typical Lao fashion, he smiled broadly and said he hoped to see me again. “Of course, Laos is very nice. I will come back,” I answered which brought an even bigger smile to his face. An elderly security guard asked me if I was headed to Bangkok. “KL,” I said. He looked at me quizically then led me to the Flight Board. Hmmmm… I don’t see a 17:15 KL flight. Strange. Maybe there’s another airport? Then I started to get nervous. I looked at the plane ticket I had printed out in Manila 3 weeks before and which until now had remained folded in my travel case. The first numerals I saw was “1:30pm”. I felt like a cold bucket of water harvested from the North Pole had been doused on me. My eyes scanned left to the Departure notice on my ticket. “9:45am.” My mind protested. “It says 5:15pm on my Blackberry Travel app.” In a flash, the memory of the Air Asia ITs being sent to my email the few days before my flight and which I had ignored ran through me. AIR ASIA HAD BEEN RESENDING THE ITs BECAUSE OF A FLIGHT CHANGE!!!!!! I know I should have read my ticket at least. Oh well. I look for an Air Asia office and the helpful security guard who by now is amused at my situation, leads me to a directory. I find the Air Asia office listed and I point to the Lao script. He opens a door to the corridor leading to some offices and there at the end is the familiar red logo of Air Asia. No use pleading for a refund as it really is all my fault. Quick flight check and it’s $205 for a flight to KL tomorrow and $105 for a flight to Clark. Too much! I think of taking the bus or train to Bangkok instead. I head to Lao Central Airlines and there I find a little bit of consolation. It’s $89 to Bangkok on an 8am flight tomorrow. I book the flight and pay for it with my credit card. While the guy transacts, I call Mixay Guesthouse and ask if I can have my room back. “Available,” the reply comes. 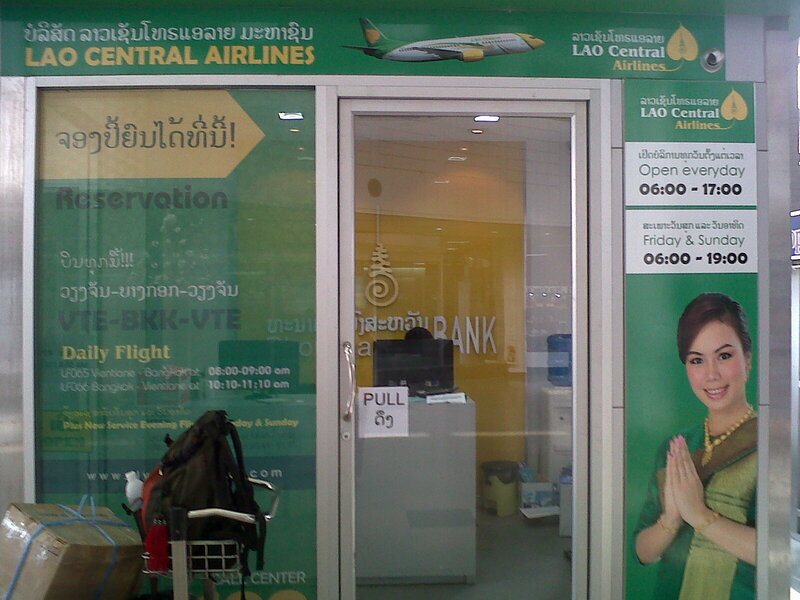 Lao Central Airlines office at the airport. I shall forever be grateful to you. 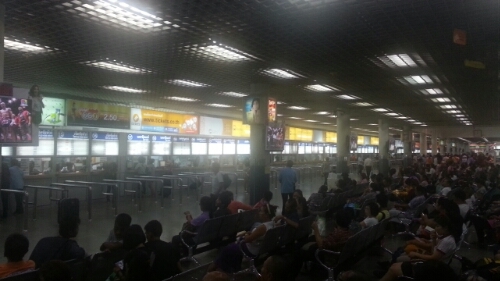 I look around the airport and except for a couple of falangs it is empty. Outside, I am met with smiles from a few security guys. News travel fast. “No flight to Malaysia,” says a chubby officer. “Hahahaha! I missed my flight,” I answer back. Lao style response to an otherwise stressful situation. To the Lao, there is no use being stressed-out over something. Life goes on. It it will even if I still have to book a Bangkok-Manila or to Clark flight which undoubtedly be more expensive. These bags ain’t going anywhere but back to the guesthouse. “Tuk-tuk,” I ask the smiley security guy. He points me to the official coupon taxi guy. I book one and in a few minutes, a spankingly clean sedan shows up at the curbside ready to whisk me back to my guesthouse. A “tuk-tuk” from the center of town to the airport costs 60,000k. 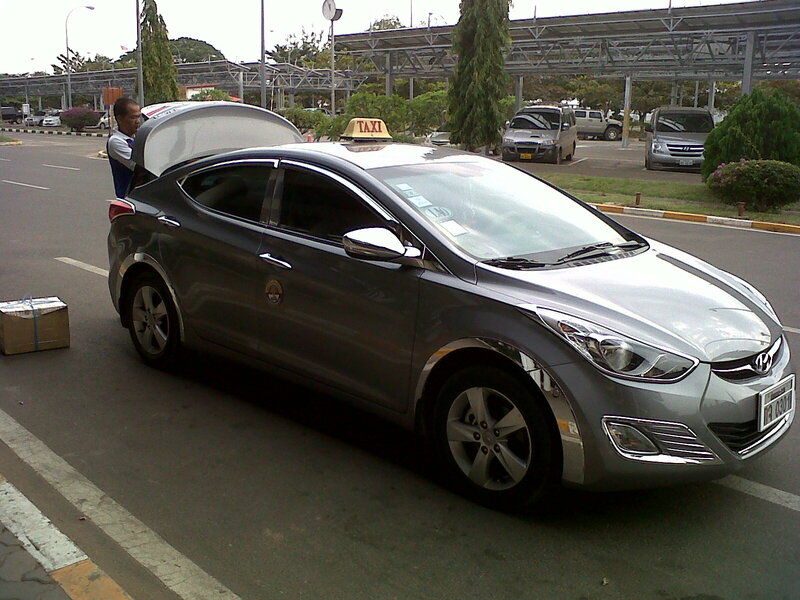 This taxi from the airport to the center of town costs 57,000k. You figure it out. The road is empty and in a few minutes, I am back in familiar territory. The peacefulness of my surroundings—- the empty airport, relaxed airline staff, smiley security guys, and the comfortable taxi, seemed out of place for my current situation. But perhaps, Laos had truly gotten to me. Except for the brief cold shock of realizing I had missed my flight and would have to pay for new ones, I was as relaxed as I could possibly be. This isn’t the first time it happened. Years ago, I had misread my flight time for my Bangkok to Manila flight which resulted in a new flight and a couple of extra days more. So I get my old room (206) back at Mixay and the guy at the counter who had earlier asked me if I were staying another night in Vientiane said if I wanted to take the Bangkok-bound bus instead. I told him I had already booked my flight but thank you anyway. At the internet shop where I am now, I just booked my Tigerairways/ Seair flight to Clark. Cost is about THB 4,600 including 25kg luggage and my choice of seat (window side, over the wing). I check my email from my bank and my available credit in my ATM which I set aside as emergency cash is more than enough to keep me high and dry even if I wanted to spend an extra day in Bangkok, something which I seriously considered. Am I okay? Yeah. Sure. This is Laos. No stress. Plus I get to go to the herbal sauna again! How cool is that.